PRO SMX is the most powerful, best-sounding DJ battle mixer Numark has ever made. Designed in conjunction with world-famous DMC champions, PRO SMX features a 100% analog audio path to preserve the natural warmth of vinyl. Introduction – Back when I reviewed the Numark DXM Pro a few years ago on DJbooth.net; I thought I was reviewing the flagship scratch mixer that Numark would see as such for years to come. I was sourly mistaken, as Numark has gone back to the drawing board with a little help from the Pro-X-Fade to deliver yet another scratch mixer for the masses. I will be the first one to tell you that Numark has truly built a serious turntablist machine that rivals the quality and features of other top-of-the-line scratch mixers that retail at double the price. 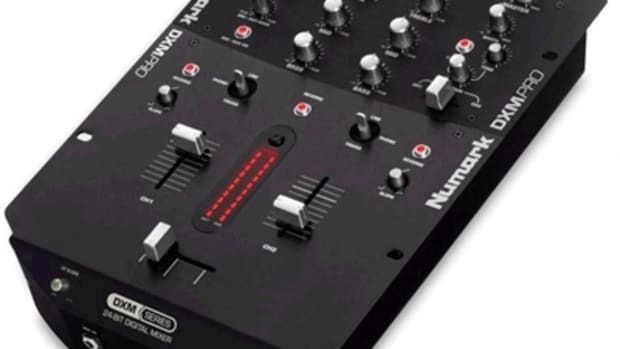 In this day-and-age of recession and troubling economic times, I must commend the effort of the Numark crew for actually developing a better scratch mixer (PRO SMX), while still currently selling/promoting another top-end scratch mixer (DXM PRO). This shows us that they are still committed to improving themselves as a brand and the way DJ’s view them as a whole. First Impressions – Right out of the box the Numark PRO SMX looks awfully familiar to me. The layout is nearly identical to the Numark SM-1 which was a highly regarded scratch mixer from the late 1990’s. Many DJ’s (myself included) found the SM-1 to be Numark’s greatest scratch mixer so it was a smart choice for the Numark Engineering team to go back to the “scratching” basics and further improve on a tried and true platform from their earlier days. The PRO SMX is made of an all black heavy sheet metal style construction with the bottom half being a dull black finish (in the fader area) and the top half has a glossier black finish (where the EQ and knobs are located). I am sure the dull finish was done purposefully so that the finish doesn’t wear quickly due to extensive fader use. Once again, I invited my brother (DJ Q) and a friend (DJ TIKO) to come to the DJ booth and really lay it on this mixer for a two day weekend session and there are absolutely no signs of color fade or physical wear to the mixer. All of the faders and knobs are made of a nice/comfortable rounded-rubbery plastic with a very sturdy and expensive feel to them. There is not one part on this mixer that feels like it will break or show major signs of abuse for a VERY LONG time. In the past, quality has been one of Numark’s weaker points as a manufacturer in the overall scheme of DJ mixers. I will put everyone’s fears to rest by stating on that the Numark PRO SMX was built incredibly strong to resist the wear caused by daily abuse of demanding turntablists as well as mobile DJ transportation needs. The edge of the faceplate is a polished silver color which adds some classy shine to the mixer. There are absolutely no screws on the faceplate which gives DJs more room to do what they want. All of the writing is white which looks good against the all black background. All the knobs and faders are black with white accents to complete the styling. In the middle of the mixer, there is a nice LED meter which allows the DJ to check the overall levels of the mix at a glance. The bottom of the mixer has four black and silver hard plastic platforms with rubber bottoms for grip. Front and Back (Inputs/outputs/controls) – On the very front of the mixer the first thing I notice are the four distinct high-quality knobs that are used for fader curve controls. The knobs really feel strong and are very thick for easy fine-tuning control. The knob all the way to the left adjusts the channel 1 Line Fader slope and the knob all the way to the right adjusts the channel 2 Line Fader slope. The two middle slope knobs adjust their respective sides of the Crossfader. So the slope of each side of the Crossfader can be independently adjusted. Above the knobs are buttons for CH1 Line Fader reverse and the CH2 Line Fader reverse. There is a metal switch for the Crossfader reverse function. To the front left is the ¼-inch MIC input and to the right lies the ¼-inch and mini inputs for the Headphones (which are also the same exact layout as the Numark SM-1). On the back of the mixer, there is a plethora of inputs and outputs. It has the three-pronged screw in type power cable input and an on/off switch above it. Next to that is the XLR Balanced Master Outputs. There are RCA ports for the FX Send and FX Return. There is a set of RCA Master Outputs and an AUX/Booth RCA output as well. Channel 1 and Channel 2 both have three inputs each (this is a cool feature allowing the DJ to hook up more equipment on a 2-channel mixer). They both have a PHONO/LINE RCA (which can be selected as either a LINE or Phono input depending on the way the switch is pressed), LINE RCA, and BALANCED ¼-inch inputs. 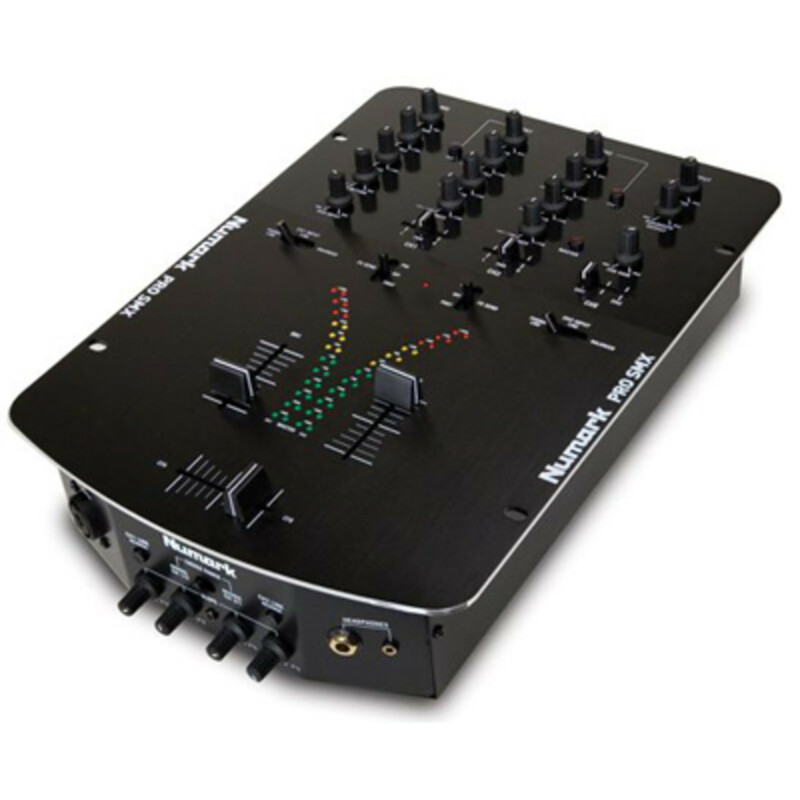 This mixer even gives DJ’s yet another AUX RCA input with its own separate volume controls. Each channel has its own grounds screw for the Phono inputs. The Faders – At the heart of this mixer, we see the World Renowned Pro-X-Fade Crossfader made by Eclectic Breaks. THIS IS HONESTLY ONE OF THE BEST-FEELING CROSSFADERS I HAVE EVER USED and it is very reminiscent of the feel of the RANE TTM style faders. I have personally used and/or reviewed many faders including; the Pioneer faders, ALPS faders, Penny & Giles faders, all Vestax faders, Focus/Optical faders and just about everything in between, but the Pro-X-Fade Crossfader simply feels and performs better the majority of faders on the market. The Pro-X-Fade Crossfader can be taken out of the mixer (using the side panel screws to remove the thick metal faceplate) to be adjusted to fit the DJ’s preferences. The Pro-X-Fade has adjustable end-points (cut-in travel distance) on each side as well as a tension adjustment that can be firm for long mixes and really loose for crazy and excessive scratching. After the adjustments were made, my DJ team (DJ TIKO, DJ BLAZE, and DJ Q) got to work scratching our hearts out on this mixer for two days straight. We were really being as rough as we could with the faders and it almost felt like the Numark PRO SMX grinned at us and asked for more abuse! Our scratches were easy to perform and the fader is very accurate and sensitive. We really had a blast with the Numark PRO SMX during our weekend scratch session and it will be a sad day when I must return it to Numark. The Crossfader on this mixer is almost like a dream come true for all turntablists and I don’t think anyone (even Q-Bert himself) will be disappointed with what is found on the Numark PRO SMX. The Line Faders are made of very high quality as well. The Line Faders are Numark D-TYPE VCDA ALPHA Faders. These faders feel so good that we almost thought they were also all Pro-X-faders because we were able to scratch using the Line faders nearly as good as with the Crossfader; and they also feel smooth and light in tension as an ALPHA fader should. Overall, the Line faders performed exceptionally well and they could easily pass for a very acceptable Crossfader on any other mixer. The fader caps are made of a rubbery-plastic material that is easy to grip and they feel really soft on the fingertips when scratching for extensive periods of time. This is definitely a vast improvement over the silver blocky caps on the Numark DXM Pro. I have had the mixer for over 2 weeks now and I have absolutely no complaints with the fader performance of this mixer. It would have been nice to see three Pro-X-Fade faders in there, but the ALPHA faders are a good compromise. The EQ and Channel Functions – The upper portion of the mixer consists of knobs, small faders, and metal switches. All of the knobs are of the same construction which is a rubbery-like comfortable plastic material that provide good grip which is similar to the faders. They are very easy on the fingertips as well. Every knob is placed atop a metal stud to ensure strength and long life. The small faders are made of a harder plastic, and the metal switches are very strong as well. Both Channel 1 and Channel 2 have their own Line selector metal switch which has three different settings which allows the channel to play from the PHONO/LINE input, the LINE input, or the Balanced input. We also abused these switches while we were scratching and they held up just fine with no evidence of static or popping. To the left there is an AUX volume level knob for the additional AUX RCA input. There is an FX Return knob above and a BASS knob and TREBBLE knob as well. On the top right is the MIC volume/Gain control knob. Above each Channel Line Fader there is a 3-way selectable switch which allows the DJ to individually select the FX SEND to off, pre, or post. Above the FX SEND switches of each channel is the Left to Right Pan small faders. Moving further up the mixer is the BASS knob, MID knob, TREBLE knob, and GAIN knobs respectively. The BASS, MID, and TREBLE knob adjustments are normally set to adjust between the range of +12db and -12db. Each channel has an “infinity” button that when pressed will light up and now allow the knob controls to be ranged from +12 to –INF for full frequency kills. The top right of the mixer there is a knob for Master Volume control and another knob for the AUX/BOOTH Volume control. Under the main volume knob controls there is the CUE GAIN knob to control the volume of the headphones. Under that is a small plastic fader (like the Pan L to R faders) which controls the headphone channel cue. To the left of the CUE controls is a CUE MASTER Button which lights up when pressed to play the Master output through the headphones (this is necessary for turntablists as we often want to practice without an audience). Sound – I haven’t been including a fully devoted sound section in most of my mixer reviews lately because they have all been very good in that category. The Numark Pro SMX deserves extra praise in this department as the mixer boasts a fully analog signal over high end components that make a noticeable sound improvement that I can actually hear. For example: While playing some of my downloaded music that may be of lesser bitrates they actually sounds better coming out of this mixer than some of the other mixers I am currently using. The Conclusion – At the end of the day, the Numark Pro SMX is a very solid entry into the Professional Scratch Mixer market. 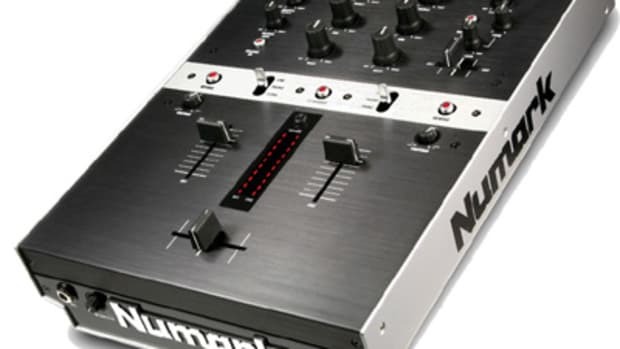 This mixer should not be taken lightly just because it says Numark on the top. There are a few things that Numark could have done differently to make this mixer nearly perfect (in my opinion anyway). They could have used EQ sliders instead of EQ knobs. I feel like when scratching, an all-fader design works nicely, but this is a matter of personal preference. Numark could have made the Line/phono/balanced input selector switches 8-way changeable so the scratch DJ could switch it to the position that is most comfortable for them to “transform” scratch. And the biggest missed opportunity for Numark was that they could have added Pro-X-Fade’s for the line faders as well. Other than those complaints, the Numark Pro SMX has all of the necessary turntablist functions, with crazy-solid build quality, a PAN fader for each line, three inputs per line (balanced/unbalanced), EQ Kills, and a PRO-X-Fade to top it all off. The biggest news of all is that Numark is able to do all of this with a comparatively low price tag of only $299. There is really nothing on the market that can come close for anywhere near that price. If there is a DJ out there that is serious about scratching and is considering purchasing a new Rane, Vestax, Rodec, A&H, Ecler, or any other mixer; then I STRONGLY suggest that they add the Numark Pro SMX to the list before making a final decision. I’m not saying that the PRO SMX is the best scratch mixer out there or even a top-three-choice… I’m not telling DJ’s who own one of those other highly regarded mixers to trade theirs in for a Numark PRO SMX any time soon either, but let it be known that there is definitely another competitive choice for turntablists that is worthy of a look. I was surely impressed by the capability of the Numark PRO SMX and I think the rest of you will be too.